Winston Wenyan Ma is a Managing Director of China Investment Corporation (CIC), the sovereign wealth fund of China, with a focus on long-term investments in large-scale concentrated positions. Since joining CIC in 2008, he has held leadership roles in major direct transactions involving natural resources, financial services, and high-tech sectors. Prior to joining CIC, he served as the Deputy Head of Equity Capital Markets at Barclays Capital. Previously, he was a Vice President at J.P. Morgan investment banking, and a corporate lawyer at Davis Polk & Wardwell LLP and Freshfields. He is the author of the bestselling book Investing in China: New Opportunities in a Transforming Stock Market (Risk Books, 2006) and has been widely quoted in global financial media. Ma was selected as a 2013 Young Global Leader at the World Economic Forum (WEF) and in 2014 he received the Distinguished Alumni Award from NYU. 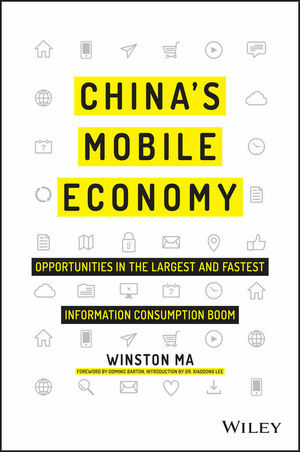 China’s Mobile Economy: Opportunities in the Largest and Fastest Information Consumption Boom is a cutting-edge text that spotlights the digital transformation in China. Organized into three major areas of the digital economy within China, this ground-breaking book explores the surge in e-commerce of consumer goods, the way in which multi-screen and mobile Internet use has increased in popularity, and the cultural emphasis on the mobile Internet as a source of lifestyle- and entertainment-based content. Targeted at the global business community, this lucid and engaging text guides business leaders, investors, investment banking professionals, corporate advisors, and consultants in grasping the challenges and opportunities created by China’s emerging mobile economy, and its debut on the global stage. Understand what the digital transformation in China is, and impact on global capital markets, foreign investors, consumer companies, and the global economy as a whole. Explore the e-commerce consumption boom in the context of the Chinese market. See how mobile Internet use, its focus on lifestyle and entertainment is aligned with today’s Chinese culture. Learn about the mobile entertainment habits of China’s millennial generation and the corresponding new advertisement approaches. The development of China’s mobile economy is one of the most important trends that will reshape the future of business, technology, and society both in China and the world. China's Mobile Economy introduces you to the digital transformation in China, and explains how this transformation has the potential to transform both China and the global consumer landscape. —John Wiley & Sons, Inc.